This article is about the music genre. 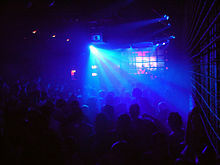 For the entertainment venue, see nightclub. For the modern style of music, see Nu-disco. 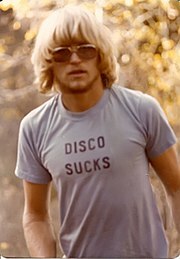 For other uses, see Disco (disambiguation). "Le Freak" by Chic (1978). Disco composition that does not use four-to-the-floor rhythm. Sister Sledge – "Got to Love Somebody"
"Got to Love Somebody" by Sister Sledge (1979). Example demonstrates the use of keyboards and horns in disco music. Sister Sledge – "Reach Your Peak"
"Reach Your Peak" by Sister Sledge (1980). Example demonstrates the use of electric guitar and vocals in disco music. "Kung Fu Fighting" (1974), performed by Carl Douglas and produced by Biddu, helped popularize disco music. Yvonne Elliman's "If I Can't Have You," written by the Bee Gees (1977) from Saturday Night Fever: The Original Movie Sound Track, the best-selling soundtrack album of all time. Blondie's "Heart of Glass" (1979) combined disco with new wave music, utilizing a Roland CR-78 drum machine. By far the most successful Euro disco act was ABBA. This Swedish quartet, which sang in English, found success with singles such as "Waterloo" (1974), "Fernando" (1976), "Take a Chance on Me" (1978), "Gimme! Gimme! Gimme! (A Man After Midnight)" (1979), and their signature smash hits "Dancing Queen" (1976)—ranks as the eighth best-selling act of all time. Other prominent European pop and disco groups were Luv' from the Netherlands, and Boney M., a group of four West Indian singers and dancers masterminded by West German record producer Frank Farian. Boney M. charted worldwide with such songs as "Daddy Cool", "Ma Baker" and "Rivers Of Babylon". Another Euro disco act was the French diva Amanda Lear, where Euro disco sound is most heard in "Enigma (Give a Bit of Mmh to Me)" (1978). 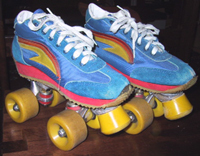 Wikimedia Commons has media related to Disco.